You won Best of Houzz 2015! [Jacksonville, Duval], January 19, 2015 – Woodsman Kitchens and Floors of Jacksonville, FL has been awarded “Best Of Houzz” for Design by Houzz, the leading platform for home remodeling and design. The 31 year old kitchen cabinetry, countertop and flooring design firm was chosen by the more than 25 million monthly unique users that comprise the Houzz community from among more than 500,000 active home building, remodeling and design industry professionals. “We have many talented kitchen and bath designers and are proud to see Jeff Reed’s beautiful work with Fox Signature Homes honored on Houzz,” said Rick Woods, Owner. 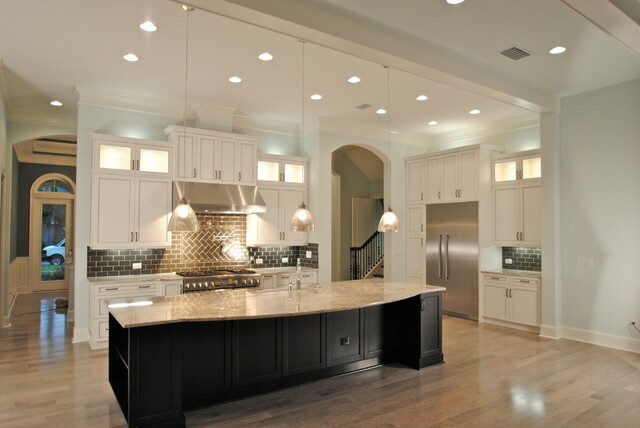 Since 1983, Woodsman has provided the finest homes in Jacksonville with prestigious lines of cabinetry, countertops and flooring along with design and installation services. New home builders and remodeling customers enjoy top notch service, selection and value on a full array of interior finish products making Woodsman a one-stop-shop. Your work won in the Design category, as your portfolio includes some of the most popular images on Houzz in 2014. We have already placed a “Best of Houzz 2015” winner badge on your Houzz profile page; visit your profile page (http://www.houzz.com/pro/nancy_love3641604) to see it. This St. Augustine, Florida kitchen remodel was designed by Terri Dubose of Woodsman Kitchens and Floors in Jacksonville. The customer’s original island was a “Bat wing” style with a 42″ high wall. On her wish list were three key elements; additional storage, a space for entertaining and a wooden range hood. Kitchen island designs are crucial for how people today are using the kitchen as a focal point of entertaining. The connection the island has with the working space of the kitchen demands careful attention to the use of space. The cabinetry is the Briarcliff door style in Java Glaze with a “Sassy” island by Aristokraft with a granite countertop and decorative tile backsplash. Beautiful. Large island for entertaining and custom range hood. This recent kitchen remodel in Jacksonville was designed by Diane Egan and features Shiloh Cabinetry. 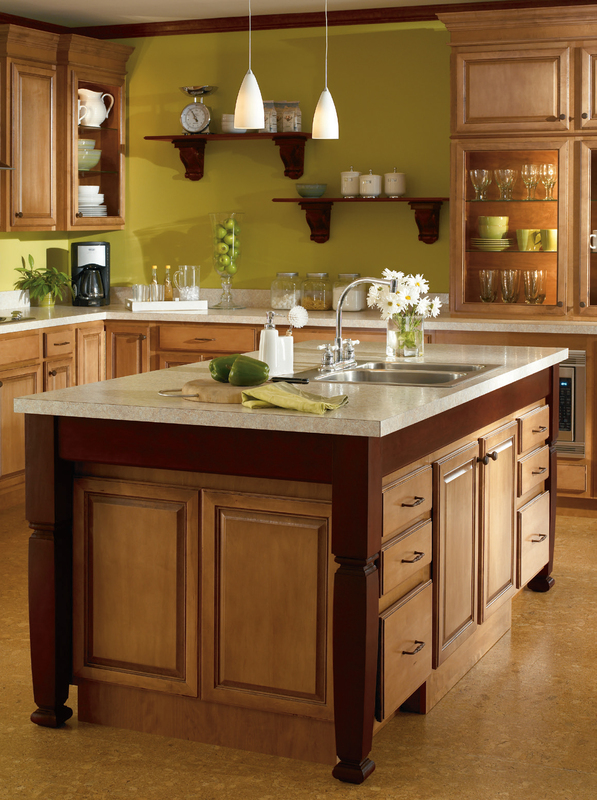 The warm and inviting island and table are the Oxford door style in Old World Cordovan. The main cabinets are medium cherry with a mocha glaze. The White Galaxy granite tops are the perfect contrast and the backsplash tile (Barossa Valley from Daltile) marries all of the elements together beautifully. The reclaimed brick floors give the kitchen that old world charm. June 29th and 30th celebrated the grand opening of ICI Homes newly furnished models in Greenleaf Preserve at Nocatee. The Preserve offers single family homes from the $400’s. The Biltmore model pictured here features cabinetry design by Janie Boyd, Senior Account Manager for Woodsman Kitchens & Floors. This ultra modern home was designed with today’s contemporary, high-tech buyer in mind. The cabinetry chosen lends itself to this high-styled design with slab doors, clean lines and dark grey and sarsaparilla finishes. The use of Cambria engineered quartz countertops in shades of white and gray is the perfect contrast to the dramatic cabinetry. You’ve got to see this one to believe it! It’s the talk of the town. Secondary bath with Teagen slab doors, crisp white tops and modern square sink. Custom vanity with white painted slab doors, open storage and absolute black top. An authentic hand-applied glaze presents another layer of beauty to your Aristokraft cabinets, adding depth, dimension and an understated appeal. The sought-after art of glazing achieves a one-of-a-kind, hand-crafted look, making each and every kitchen distinctively different and uniquely yours. Aristokraft’s Hand-Contoured Glazing™ is an additional step in the finishing process that highlights door detail and enhances the richness of wood color and tone. Because glazing is achieved by hand, variation may occur throughout any door, from one door to the next. The outcome will range from a consistent, even appearance to more varied coverage. The variation is a desirable feature and brings out the uniqueness of glazing. Glaze hang-up is a desirable attribute that adds a warm sense of authenticity. The complexity of the door’s design will cause variation in the amount of hang-up in grooves and corners, which is a natural outcome of our hand-wiping process. In March of 2012 Woodsman Kitchens and Floors celebrated the grand opening of their full service counter top fabrication facility. Woodsman, a leading Corian fabricator for over twenty-five years, has expanded its’ manufacturing to include the most innovative granite fabrication equipment available. This new state-of-the-art equipment gives Woodsman the ability to fabricate granite and engineered quartz surfaces on site. The 20,000 square foot facility includes management offices, manufacturing and quality assurance operations as well as an exterior slab yard. “While this is a significant investment for us, we felt it was time to take control of our granite manufacturing to ensure top-notch quality and service,” stated Rick Woods, Owner. “ We’ve been very fortunate to maintain a loyal customer base and want to continue providing them the best possible service, selection and value in this important product category.” Woodsman has been the largest provider of granite tops for the past few years. This new facility will allow an increase in capacity of an additional 30%. A member of the Northeast Florida Builders Association, Woodsman was founded in 1983 by Rick Woods and provides Jacksonville area builders and homeowners with impeccable service on full lines of cabinetry and counter tops, ceramic tile and stone, hardwood flooring, carpet, vinyl and design services. Visit Woodsman’s “home idea center” at 11732 Beach Blvd. Hours are 8:30 a.m. to 6 p.m. Monday through Friday and 10 a.m. to 4 p.m. Saturday. Granite slab yard in Jacksonville.